This trek is fine for a complete novice with a reasonable degree of fitness as it is very easy going underfoot following a clearly defined path. As this is the longest path to the summit it also means it has a gradual steady height gain with no really steep sections. 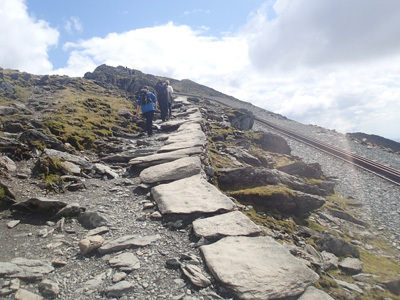 This trek starts by going past the Snowdon mountain railway station, during the whole of this trek we never go far from the railway track itself, and we trek up a tarmac path until we go left over a stile. The views now open up dramatically as we look across the valley to the Moel Eilio ridge line and Moel Cynghorion, we then walk steadily towards the imposing cliffs of Clogwyn Du`r Arddu which has some of the hardest climbs in Wales on its 700 foot vertical cliff faces. There is a faint path to the right which goes to these cliffs but we carry on along the main path rising steadily until we go through a small tunnel to be met with huge drops down into the Llanberis pass far below on our left .As we reach the upper slopes the Snowdon Ranger path comes in from the right and on the left is a 2 metre high upright stone (monalith) which marks the exit from the zig zags of the Pyg Track. It is then a nice and steady trek enabling us to enjoy the wonderful views to the summit. 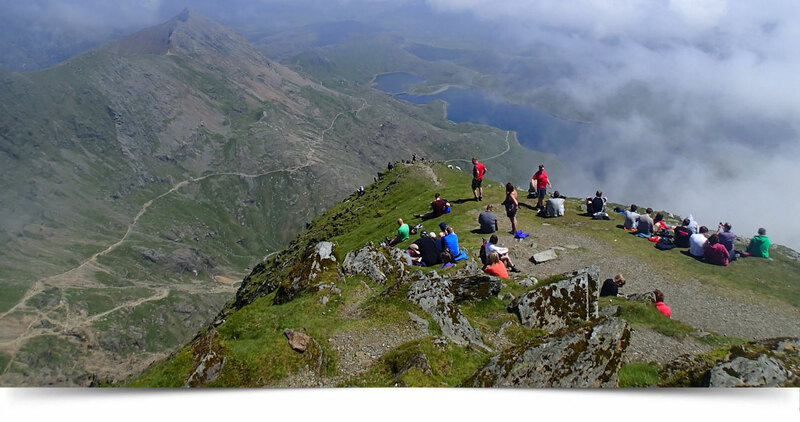 This trek starts on the southern side of Snowdon which means it is a very quiet route, slightly steeper in sections than the Llanberis path but still well within most people’s capabilities with a reasonable degree of fitness. 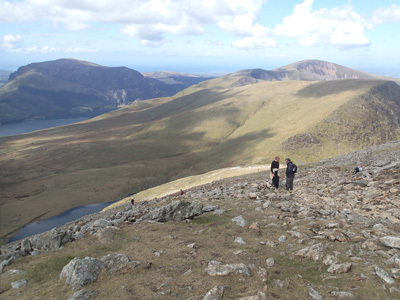 This trek is ideal for anyone who is wary of heights as most of the height gain is achieved going up a very wide ridge which keeps us far away from any drops until the path joins the Llanberis path high up the mountain.